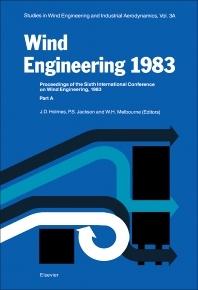 Wind Engineering 1983, Part A contains the proceedings of the Sixth International Conference on Wind Engineering, held in Gold Coast, Australia, on March 21-25, 1983 and in Auckland, New Zealand, on April 6-7, 1983 under the auspices of the International Association for Wind Engineering. The conference provided a forum for discussing topics related to wind energy and wind engineering, from wind characteristics and wind loading to full-scale measurement and modeling of buildings and other structures. Comprised of 36 chapters, this volume begins with an assessment of the wider application of reliability principles in the treatment of wind loading, paying particular attention to the influence of wind direction and the role of full-scale testing in reducing uncertainty. The reader is then introduced to wind characteristics, with emphasis on strong winds and tropical cyclones; wind loading of tall buildings and low-rise structures; and instrumentation and experimental techniques for wind loading. The base balance technique for the determination of dynamic wind loads is described, along with a detailed design method for pneumatic tubing systems and a digital system for the measurement of wind effects on large structures. The final two chapters deal with active modeling of large-scale turbulence and selection of local peak pressure coefficients for wind tunnel studies of buildings. This monograph will be of interest to students, practitioners, and researchers concerned with wind energy and wind engineering. Ovalling of Chimneys: Induced by Vortex Shedding or Self-Excited?